Songify is a simple, fun app that allows you to record yourself (or students) speaking and then transforms the speech into a song. There are three styles that are free, and then more you can purchase. What a great way to practice your elocution skills. Magic Numbers is plain and simply a fun parlor trick... but it sure is fun to stump my husband and sons. Also, it makes you work on your addition skills! Sandbox also has a lite version, is literally a digital sandbox... with fun tools for a zen like experience on your iPad. 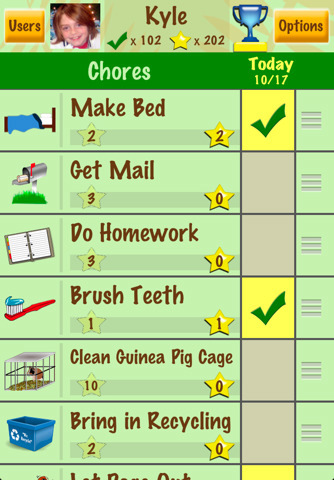 Chore pad can replace your chore charts, tokens, etc. There is a lite version to try for free, and the full version (keep in mind it is a separate download, so don't enter too many chores in the lite version, you'll have to do it all over again if you opt for the full version) you can add multiple children. Thanks for including Chore Pad in your digital Kindergarten Sue! Songify is hilarious! Glad I stumbled upon your blog!